He set up linemate Sean Kuraly for the game-winning goal midway through the third period of the Winter Classic against the Chicago Blackhawks at Notre Dame Stadium on New Year’s Day. 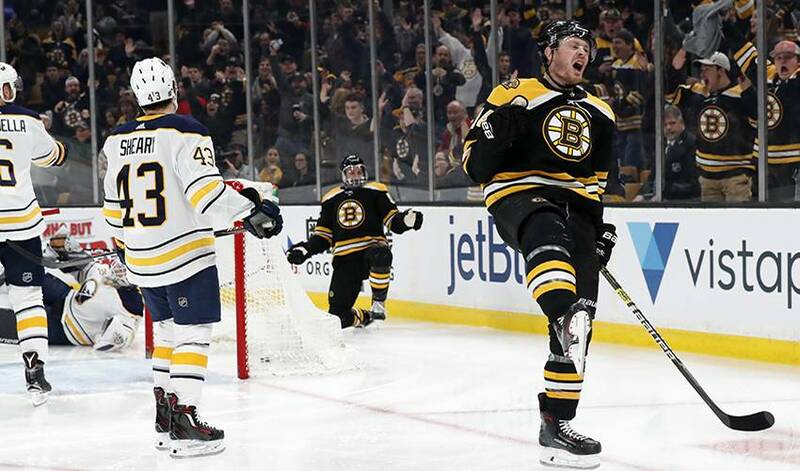 The Bruins returned home to knock off the Western Conference-leading Calgary Flames on Jan. 3. Wagner also scored game’s opening goal in the first period of the Bruins 2-1 win against the visiting Buffalo Sabres on Jan. 5. He had deposited a goal on the game’s first shift, too, but had that one wiped out when it was deemed Kuraly had interfered with Sabres goalie Linus Ullmark. Nevertheless, Wagner scored a few shifts later. He kissed his glove and then pointed skywards in tribute to his maternal grandfather James (Jimbo) Phelan, who had passed away the day before at age 81. Phelan watched the outdoor game from home and was no doubt proud of his grandson and his local Bruins. Wagner remarked that his grandpa probably would have chuckled from above at his disallowed goal, only to see him score a short time later. “I kind of felt [the goal] was coming,” Wagner said. “We had some good chances. I don’t remember how I felt immediately after I scored. I kind of blacked out. Jimbo Phelan was a United States Army veteran who returned home to the Boston suburb of Norwood to work in the Norfolk Sheriff’s office as a drug and alcohol coordinator. He didn’t talk much about his service abroad. But when it came to sports you couldn’t get him to stop. He was a massive New England Patriots fan and likely pleased they’re on the way to another AFC championship game this weekend. Phelan was a varsity athlete in high school. He competed in most sports, but especially enjoyed his time on the football and basketball teams. He would later coach tennis and learn to love hockey because of his grandson. Wagner liked all sports, too. But hockey was and is his passion. His father Paul played in high school and Division III in college. “I don’t think [Phelan] watched hockey until I came around and started playing,” Wagner said. The Bruins forward had just enough time following practice on Jan. 7 to attend his grandfather’s funeral. Afterwards, a huge turnout of family and friends assembled at the Old Colonial Cafe to celebrate and reminisce about Jimbo’s life. The Old Colonial was his hangout. When his grandson signed a two-year deal with the local Bruins last summer, Phelan persuaded his favourite haunt to hang his grandson’s No. 14 sweater with the spoked B. What was Jimbo’s reaction to Wagner joining the Bruins after previous stops with the Anaheim Ducks, Colorado Avalanche and New York Islanders? “He cried, along with a lot of my family,” Wagner said. Yes, these are emotional, but good times for Wagner. His Bruins have plucked 13 out of a possible 16 points in their last eight games. Things have gone well for him on the fourth line with Kuraly and Noel Acciari, who played with Wagner on the South Shore Kings junior team a decade ago before he earned a scholarship to Colgate University. Sometimes, it’s not easy to play for the hometown team, the team you cheered for as a youngster. But that hasn’t been the case for Wagner. “It’s been everything you could have imagined,” he said. “I didn’t know if it could live up to the hype. There really hasn’t been as much pressure as I thought.